Mixing styles can add dimension to your personal style. For this look, we added a denim jacket to urbanize this classically preppy look. We're back! Between grad school finals, which nearly defeated me (accounting is the worst! ), and holiday madness, we're proud to bring you all new content for the new year starting with our latest series, The Daily Strut. Consider it your average OOTD post with our Stitch & Strut twist. Before we delve in to this preppy but urban menswear look modeled by our very own photographer, I'm happy to announce I am now working at Coach! I've worked at Aerie by American Eagle for two and a half years part time while in school but have now added Coach to my resume. It's been a little hectic juggling two jobs and grad school, but I love the Coach brand and the new direction it has been heading in since Stuart Vevers took over as creative director in 2014. I'm particularly excited about the spring 2015 line with Gary Baseman, an amazing California-based artist who you'll probably know from his artwork for the Cranium board game. As the launch of the line gets closer, I'll be offering up my coverage and how to style the pastel, creature-adorned bags and key rings into your spring wardrobe. For this Daily Strut, we take a staple denim jacket and use it to urbanize a classically preppy look. A denim jacket like this Levi's standard trucker jacket is a must for everyone's wardrobe, male or female. A denim jacket is a must in everyone's wardrobe, male or female. It's a timeless piece that can be styled so many different ways, anywhere from a country feel to grungy vibes. And if you're into the normcore trend, a denim jacket can work with that too. It's versatile and classic, a piece you can comfortably splurge on for its lasting appeal. Levi's is the go-to brand, and for this look, we chose the Levi's standard trucker jacket in a light to medium wash. This jacket urbanizes a classically preppy look underneath. Fonzi wears a striped oxford from Cotton On untucked underneath a gray sweater vest by Lotte Island and worn with Hot Topic Khaki chinos. To accessorize, Fonzi wears leather and canvas Cole Haan sneakers, a croc embossed world map watch from Jack Threads and Clubmaster Classic Ray-Ban sunglasses in green. It's a casual look great for weekend outings or a trip to the movies (we'd definitely see Inherent Vice in this outfit). Mixing different styles, in this case preppy and urban, can add dimension to your personal style. You can mix your price points too. Remember, splurge on classic pieces like this denim jacket or Ray-Ban shades, and save on more trendy pieces or everyday staples like sweater vests and chinos. It's all in the details. This Jack Threads watch gives off an old-world feel with its map face. 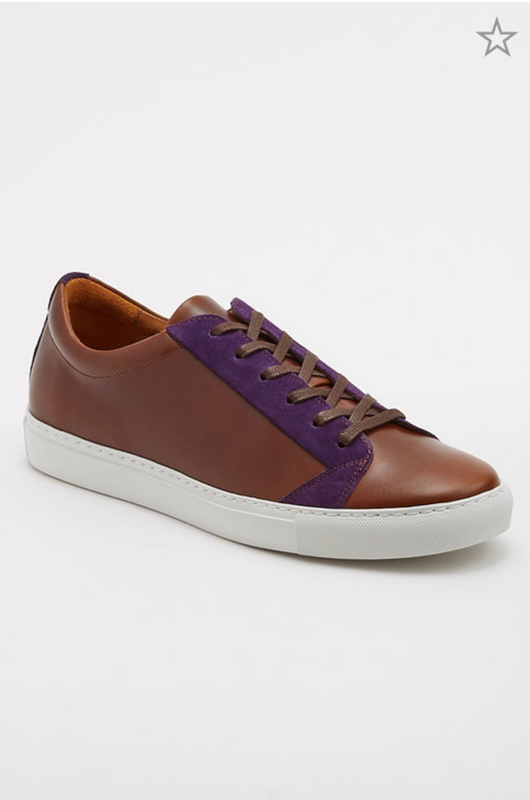 These Cole Haan sneakers will keep you both comfortable and stylish. This casual look can get you through the weekend from errands to a movie date. Checkout the gallery below for some of the pieces mentioned above and similar clothes you can buy now. Click through for links and check us out on Facebook and on Instagram @stitchandstrut.